This photograph is of the Biological Research Station, which is where the KAIRA team are staying. However, this is a slightly different view. 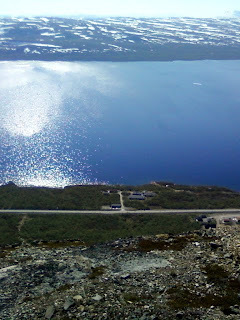 The photograph was taken looking over the precipice of Saana during the excursion last week. Yes, I was being careful when I took this! Just beyond the edge, and far below, are the buildings of the station. Then there is the lake itself. There were a few pieces of ice floating about (there's one in this view), but the lake is mostly clear now.